Karama Lodge & Spa is an Eco friendly lodge located in Arusha, Tanzania. 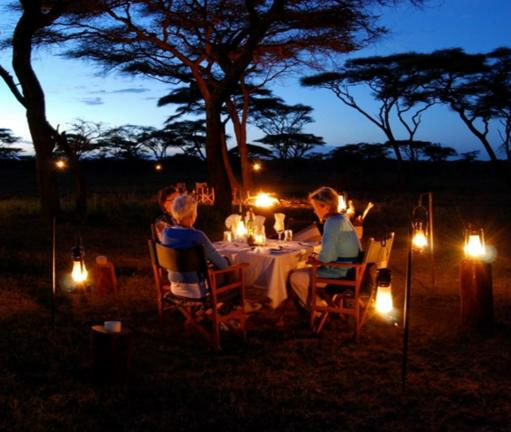 It offers an ideal base for a Tanzania safari or a restful night of sleep before climbing Mt. Kilimanjaro. The bar is open all day for a cool beer, a glass of wine, spirits or a healthy fresh fruit juice. Guests can sit on the spacious open deck and enjoy a drink while taking in the breathtaking views of Mt Kilimanjaro, Mt Meru and the wooded valleys below. Karama Lodge is situated at the top of the lush and serene Suye Hill. 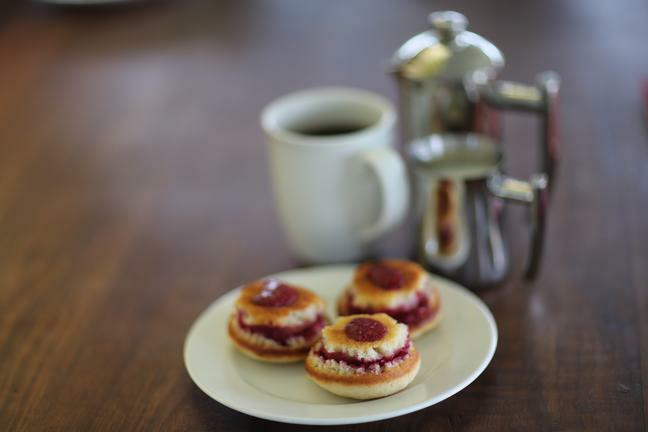 It is a unique lodge with a rustic, yet comfortable ambiance providing a relaxed atmosphere. 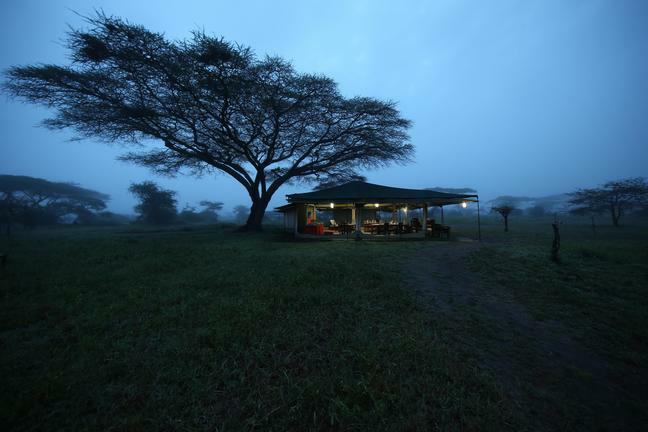 Shira Camp forms part of the second leg of the journey up Mount Kilimanjaro. There are 2 camps - Shira Camp 1 on west side and Shira Camp 2 on the east. The Shira Plateau landscape features a tropical rainforest and shrubland where a range of flora and fauna species are found. Climbers might also spot the White Naped Raven. Barranco Camp is the third pitstop along the Machame Route climbing up Mount Kilimanjaro. 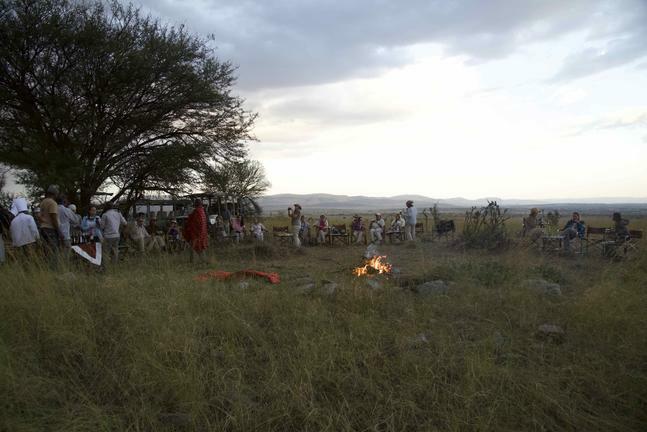 This area of the mountain is semi-desert and the camp is set in a valley close to the Great Barranco Wall. On day 4 of the route up Mount Kilimajaro, climbers would reach the Karanga Camp. The journey would take about 5 hours and climbers get to experience the alpine desert landscape of Mount Kilimanjaro. Mount Kilimanjaro climbers would approach Barafu camp at about the 5th day of the journey. The word 'barafu' is the Swahili word for 'ice', which refers to the cold climate at this altitude. 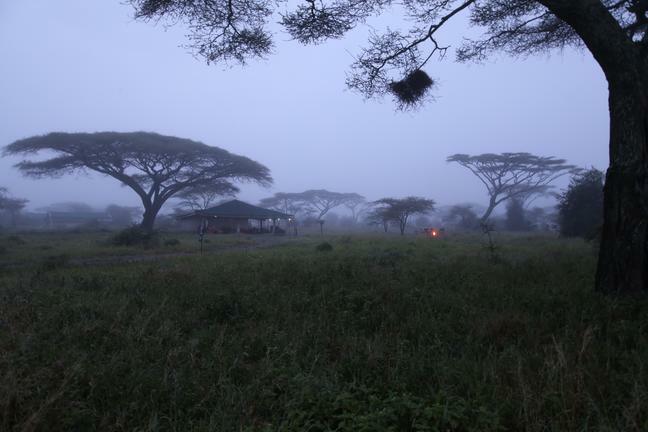 Mweka Camp is the final campsite on the journey up Mount Kilimanjaro. Climbers would arrive here after a 7 hour hike from Summit Uhuru Peak. 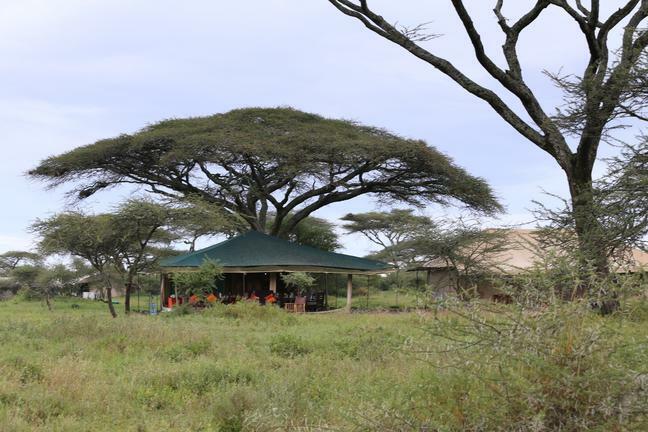 Endoro Lodge is an eco-friendly lodge located along the boundary of the Ngorongoro Conservation Authority 5.5 Km from the town of Karatu, 0.5 Km from the Endoro Gate, 20 Km from the Ngorongoro Main Gate and 25 Km from the Manyara National Park. 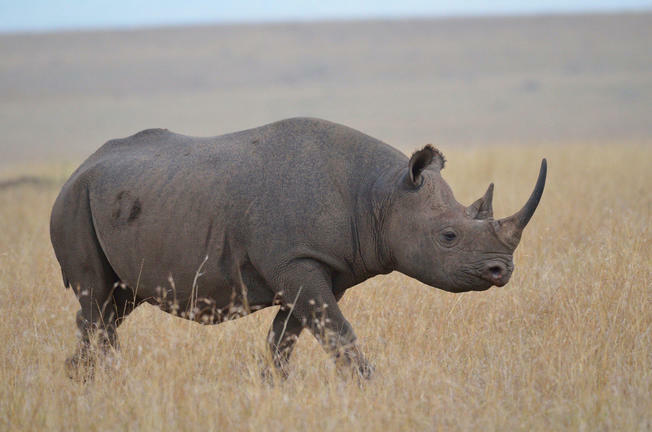 Located on the edge of the Northern Highland Forest Reserve, the forest boasts over one hundred bird species, as well as resident elephants, buffalo, baboon troops, and the occasional lion. 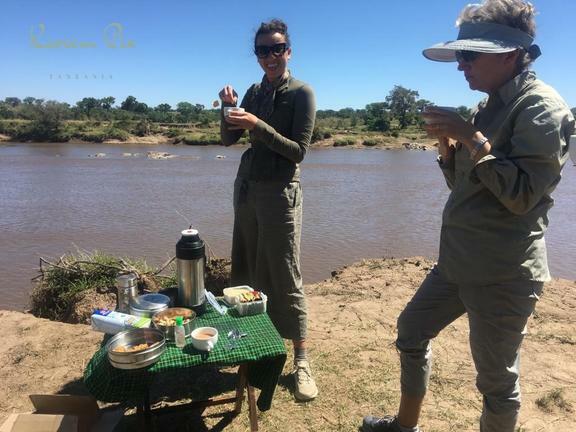 Within a few minutes walk of the Endoro Lodge, you will find the Endoro River Nature Trails suitable for hiking, bird watching, animal viewing and plant identification. Endoro Lodge features all private and detached chalets. Each chalet has its own immersion tub, outside shower, private veranda and fireplace. The restaurant boasts both African and Western cuisine. The dining room is literally a glass portal to the world outside. Watch the sunrise while overseeing the early morning mist glide gently over the valley. Following a day of pleasant surprises and uncompromising pleasures, relax over a delicious four course meal, followed with an evening of star-gazing under a spectacular star-filled sky. 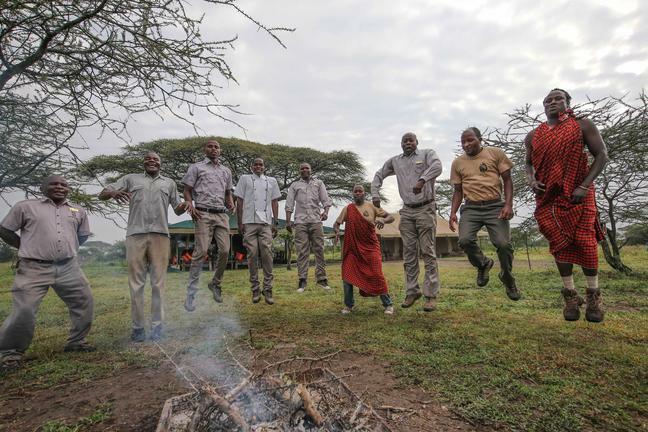 Nasikia Mobile Migration Camp is moved and constructed each year to follow the migration herds and to maximise the experience of staying in the heart of wildlife action. 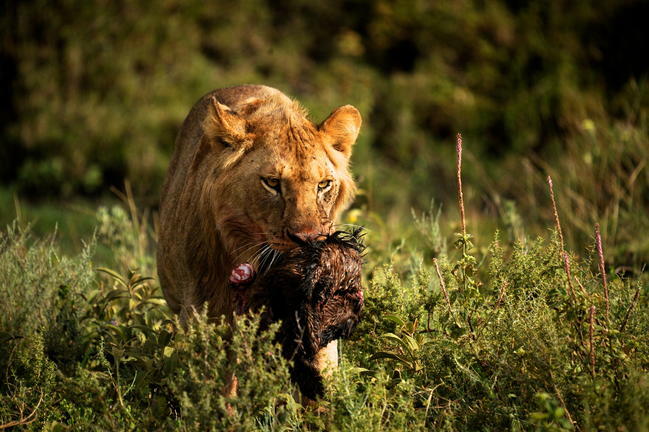 From the southern plains of Ndutu in the Ngorongoro Conservation area to the rolling landscapes of northern Serengeti. The number of tents varies and never exceeds 12, so a maximum of 24 guests at any given time. 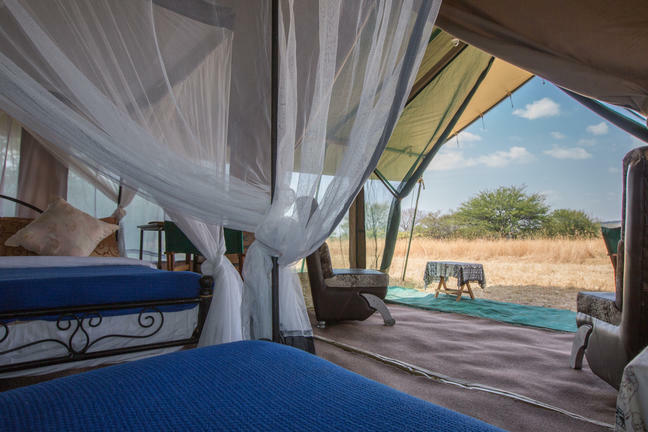 This is the ultimate and original tented camp experience with ensuite bathrooms, bucket showers, comfortable bedding, beautiful linens and a dining and lounge tent for relaxing and escaping the heat of the day or inclement weather. Food here is a highlight, home cooked style delights always too much to consume! Service is friendly and personal as its owner run with a team of outstanding local staff to ensure your every need is catered for. 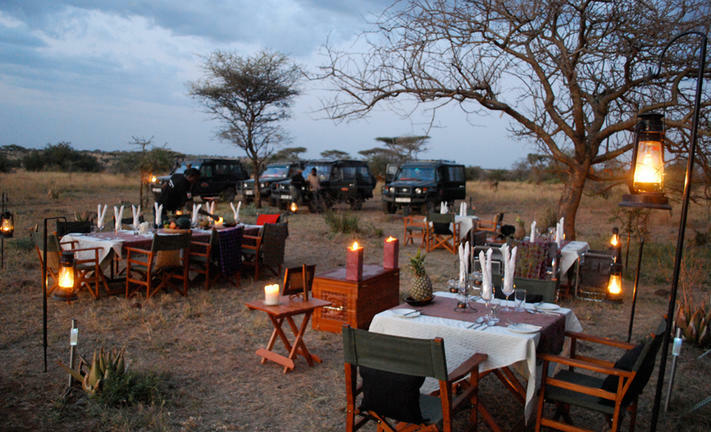 Bush Dinner Credit: Nasikia Camps Private bush dinner can be arranged for the family, honeymooners or a group of friends. 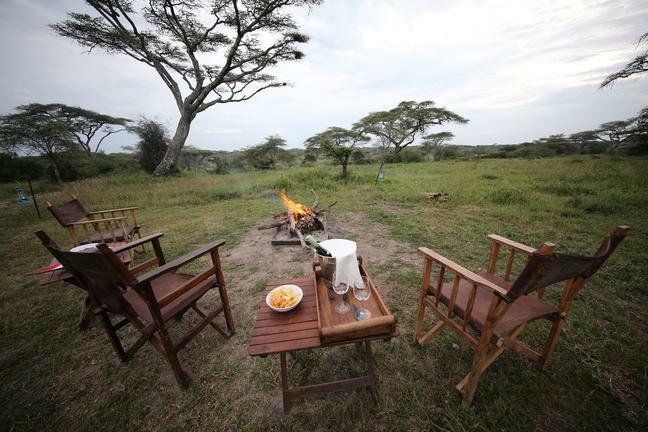 Sundowners in the Bush Credit: Nasikia Camps A fireside Gin & Tonic while watching the sun goes down is never amiss. 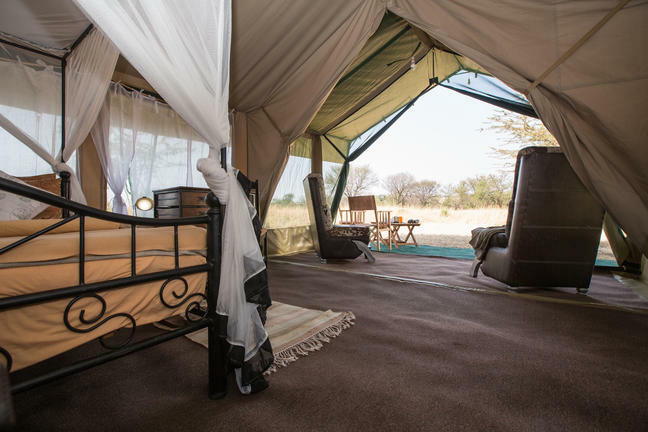 We offer double (a honeymoon option), twin, single, triple and family (quad) tents and each bed is fully netted for custom made protection from mosquitoes and insects. The beds are fitted with imported cotton sheets, double pillows, duvets and bed runners for your comfort. The tents have netted windows down each side of the tent which you can fully open only the canvas remaining at all times with the mosquito netting stitched strongly into the actual tent. Then comes the bathroom area, which can be accessed directly from the bedroom with a separate doorway. Once inside, there is a bathroom stand with a ceramic wash basin with running water via stylish taps, a mirror, a supply of natural based bathroom products, and linen to suit the number of people expected to occupy the tent. This area also displays a woven grass mat and cloths rack. Within this area, there are additional toilet and shower areas for privacy. Inside the toilet area is a ceramic flushing toilet, encased in a wooden frame for stability. Inside the shower area, is stand for washing behind a shower curtain and under a 20 litre PVC bucket erected on a pulley system as required. From the entrance to the bedroom and onto the bathroom, each tent is fitted with an extensive solar lighting system for your convenience. 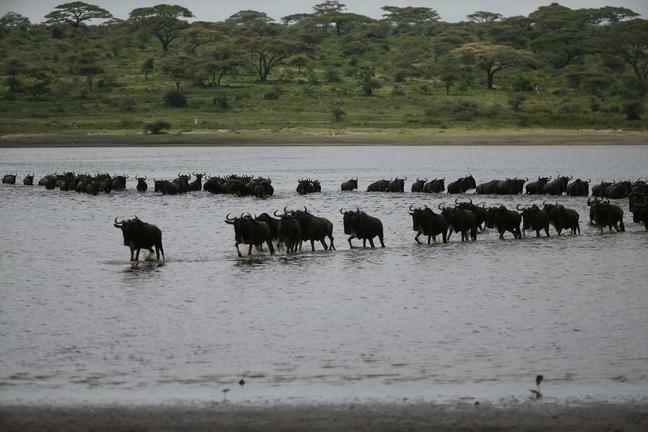 Nasikia Mobile Migration Camp follows the Great Wildebeest migration, as well as other wildlife from the Ngorongoro Conservation Area to the Serengeti National Park. By being mobile, the camps are able to offer the best wildlife viewing. There are 12 tents that are 12m by 4m, each with a cooling feature of shade-clothing over the tent. Nasikia Mobile Migration Camp moves between two locations through the year, except for April and May. 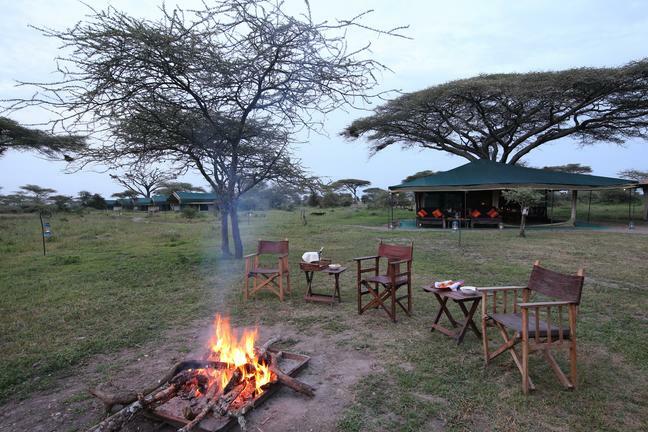 From December to March, the camp is in Ndutu, Ngorongoro Conservation Area and can be reached by road or Ndutu Airstrip. 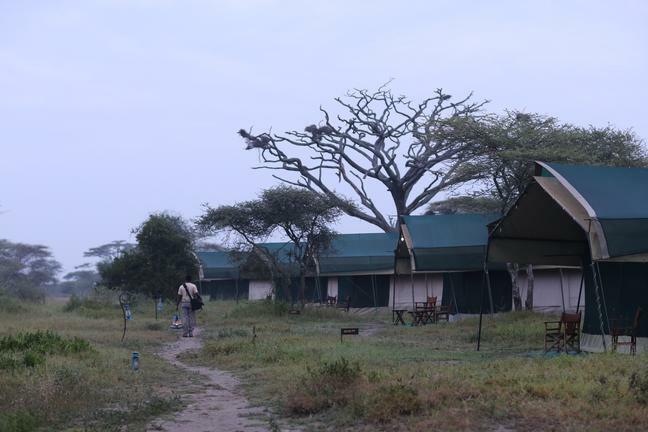 From June to October the camp is in northern Serengeti near Kogatende (Kitchwa Tembo) and can be reached by road or Kogatende Airstrip. 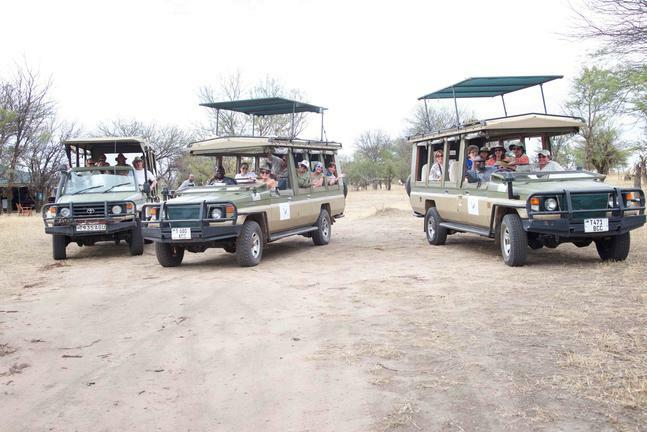 For game packages - wildlife viewing and bird watching game drives are offered twice per day. 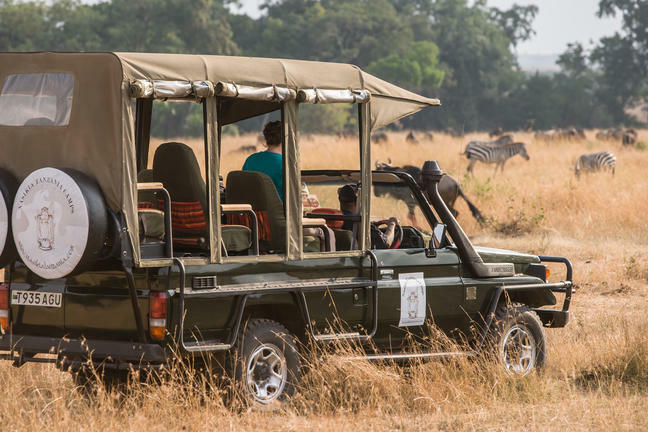 Experienced guides encourage guests to see and experience the Serengeti through their eyes, sharing a world of small and large wonders that only they truly know and understand. 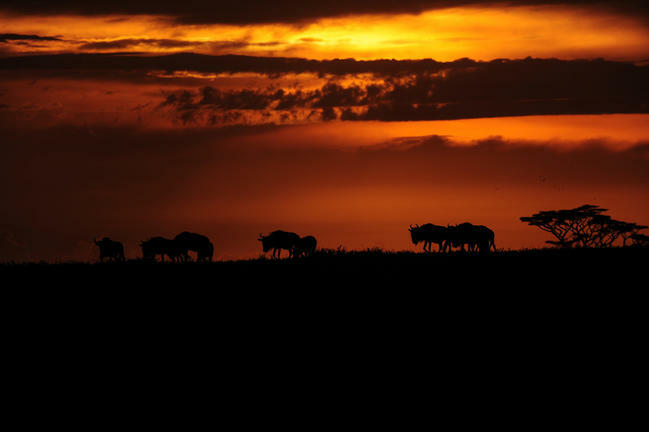 Balloon safaris are a romantic and evocative way of experiencing the wilderness of East Africa, as you silently fly over the plains teeming with herds of wildlife in the early morning. Typically, a balloon safari begins around 6am and lasts for around 1-2 hours. 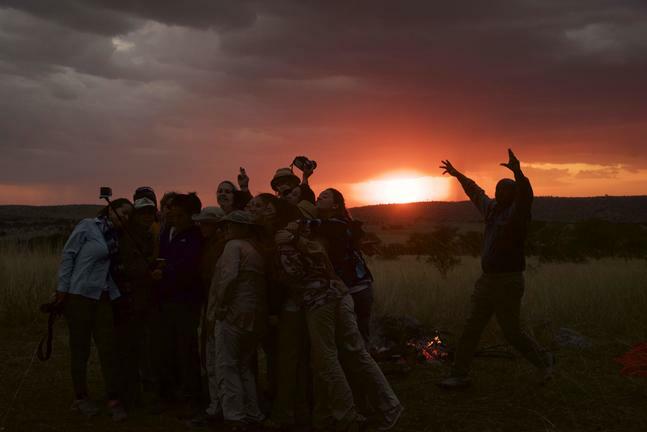 Balloon safaris (additional cost) in the Serengeti take off from designated sites in the nearby Ndutu or Kogatende areas depending on camp location. 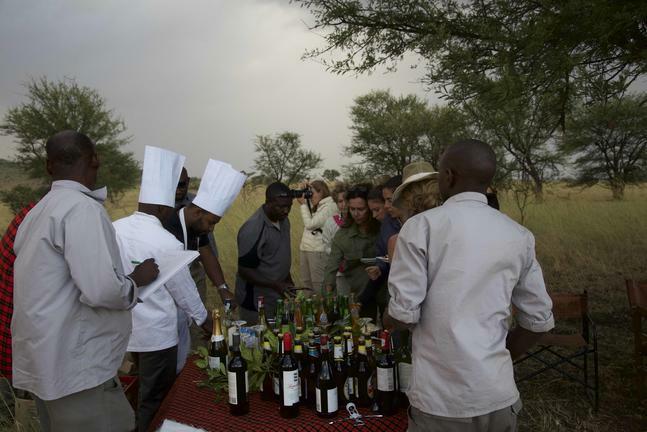 The safari is followed by a champagne breakfast in the bush, a fitting end to a memorable flight in the wild. 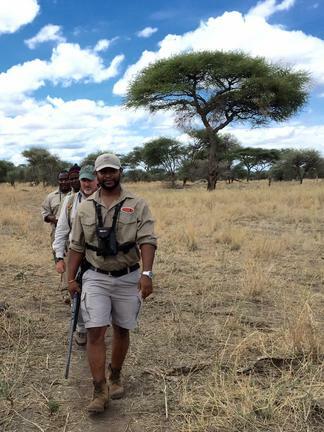 Explore the intriguing wilderness on foot with an armed walking guide; follow the tracks, smell the herds on the breeze and hear the crunch of fauna underfoot.Ideally these are at dawn and dusk, before and after the heat and stillness which prevails around the middle of the day when the animals (and most people) take a rest. 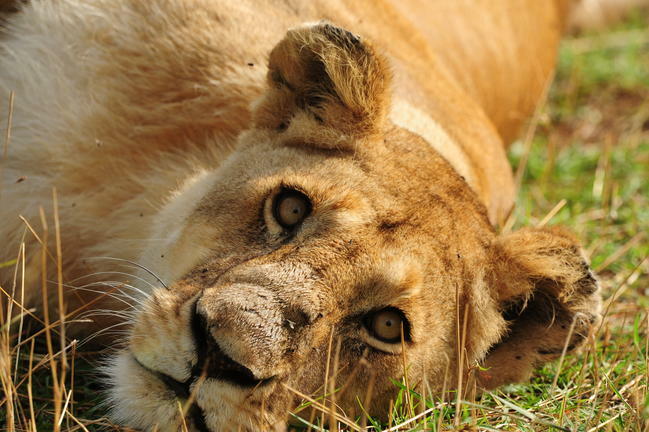 Our bush guides have a wealth of insightful experience and they will fascinate you with bush-wise facts, wildlife know-how, local customs and incredible stories of life in the wilderness. 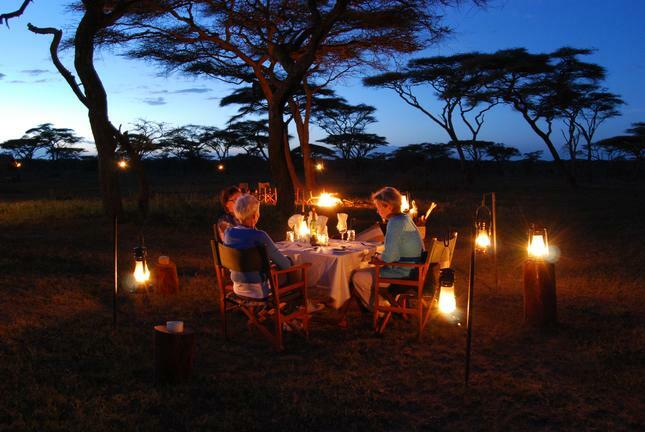 Enjoy a camp meal outside under the infinite African night skies - a beautiful way to experience the bush. 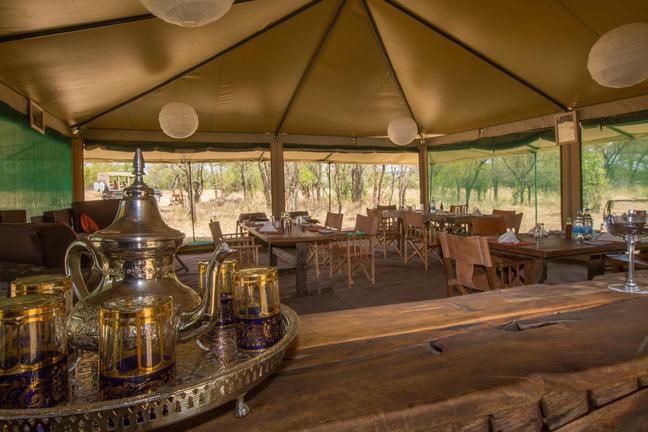 The dining area at Nasikia Mobile Migration Camp offers a comfortable way to enjoy camp meals with a fully netted tent, recycled and locally designed furniture. 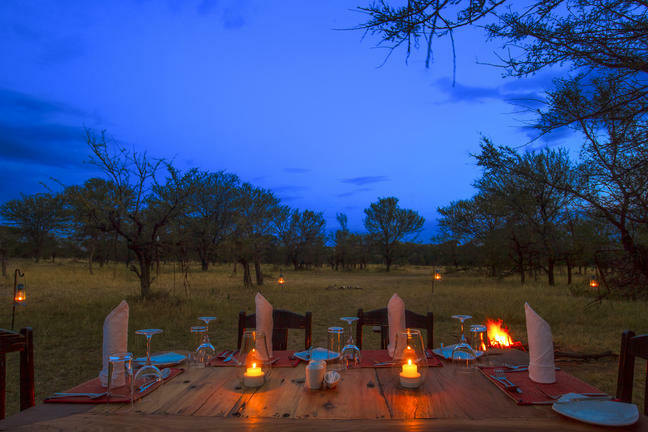 Take advantage of a la carte or buffet menu, along with fully stocked bar to select drinks (additional charges) for a sundowner by the camp fire. 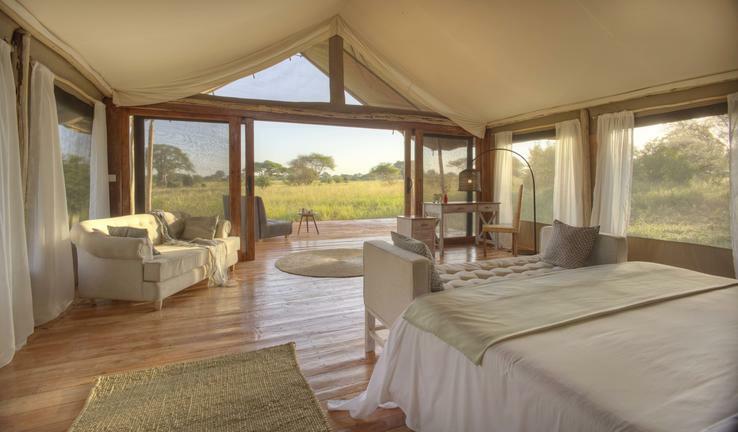 Tarangire Ndovu Tented Lodge is located in the heart of Tarangire, Tanzania’s wild land and landscapes. Tarangire is famed for its massive elephant herds, true sense of wilderness and a gentle backdrop of baobabs. It is the lesser visited but more intriguing park on the northern circuit. 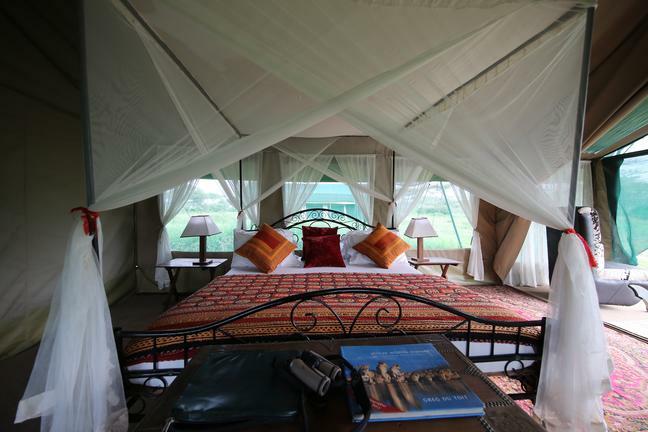 At Tarangire Ndovu Tented Lodge, we have 10 standard tented suites PLUS 2 x 2 bedroom inter-connected tented family suites that are open throughout the year. 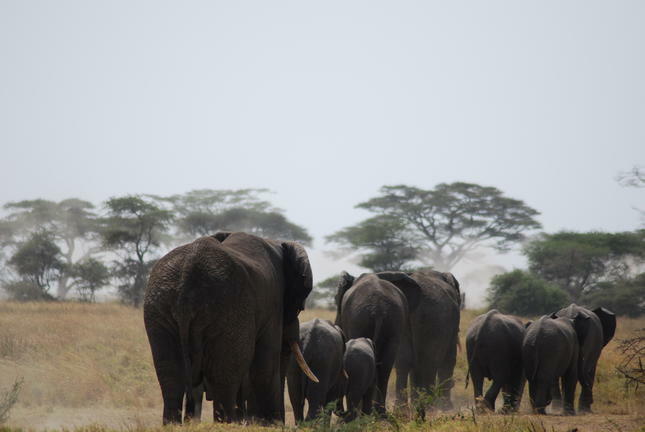 During these dry months, the massive elephants herds travel through the corridor between Manyara and Tarangire and spend their time in and around the park. This is because of their ability to uncover permanent sources of fresh water. 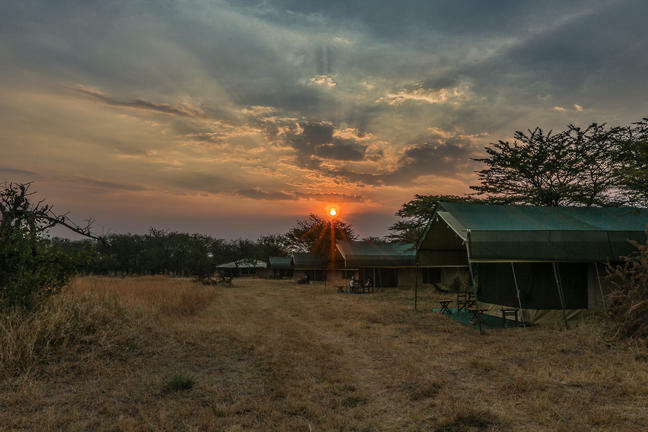 We endeavour to retain the uniqueness and intimacy of the camp, while being directed by the location, wildlife and other factors of responsible tourism. The main thatched area is open plan from bar to lounge to dining area - and offset with a stunning rim flow pool in front of the property overlooking the wild expanses ahead, all the way to the Great Rift Valley wall. Bar Area Credit: Stevie Mann The main area houses a bar, lounge and dining in an open plan manner - and all under a pitched and thatched roof. 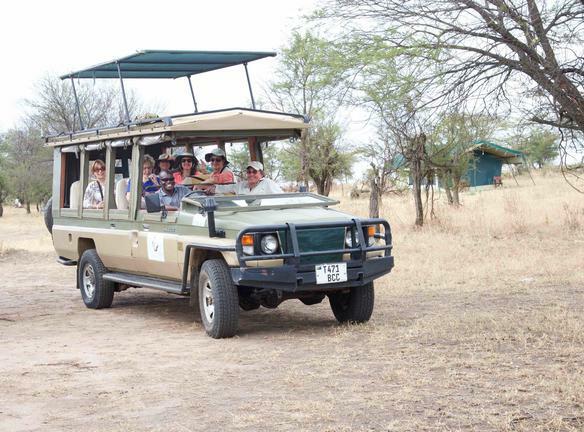 Set up on a platform with views across the bushveld in front, the area can easily accommodate incredible bush breakfasts and lunches followed by dining under clear African skies. We have left the natural environment intact, and built the structure woven amongst the baobab and acacia trees. Tented Suite - internal Credit: Stevie Mann The tented suites are all under canvas while raised on wooden platforms in the bedroom area, and polished concrete for the ensuite bathrooms. The suites are netted windows down the length of each bedroom that can open and closed as preferred, and flowing light curtains at the ready to maintain privacy. The front entrance is wooden framed sliding doors, opening onto a platformed balcony with outside love seat to sit and watch the wilderness in front. All furniture in the camp is handmade in Tanzania. Main Area Credit: Stevie Mann With peaked thatch, the main area maintain the natural feel of the camp. Wooden flooring, decks and furniture are displayed in open plan style with roll down canvas walls to open and close as weather permits. Fish basket hanging internal lights, and phase down outside lights allow all to experience incredible sundowners out by the campfire under infinite African skies. The deck area provide great space for outside dining, while homely inside furniture offers comfortable indoor areas to lounge and enjoy the sounds of the wild. Pool Credit: Stevie Mann Encased in locally sourced wooden platform, the rim flow pool at Tarangire Ndovu Tented Lodge is a welcome relief after a long day of game driving. 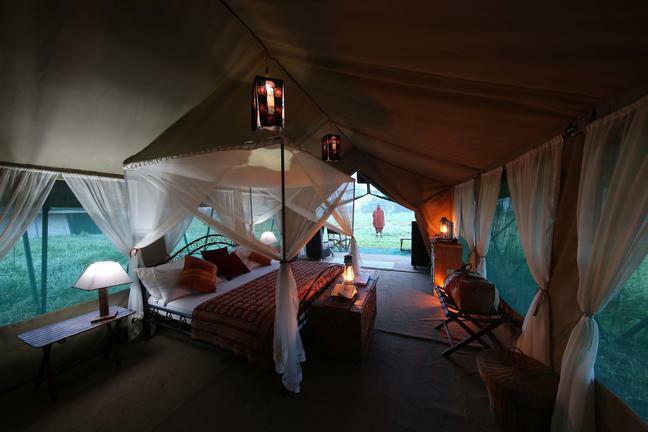 Sunlounges and a wooden gazebo offer areas to relax, and the fresh water washes away the 'safari powder'. With public toilet and shower area nearby, watch the close flora and fauna species as you swim. Mnarani Beach Cottages is a beach resort hotel in the village of Nungwi, next to the old lighthouse. “Mnarani” means “lighthouse” in Swahili. It offers excellent accommodation suitable for honeymooners as well as families and couples looking for a wonderfully relaxing break. At Mnarani you will be able to develop the art of doing nothing on a beautiful beach, however there are also plenty of activities available, from spectacular snorkelling, diving, fishing and sailing to many interesting half and full day excursions on the island of Zanzibar. The hotel is very peaceful and secluded, but also within walking distance of the lively village of Nungwi. The beach cottages are equipped with all the essentials: en-suite bathroom, air conditioning, fans, mosquito nets, safe deposit box and individual verandas. There are two apartments, one with two bedrooms and another with three bedrooms. Each room has its private bathroom en suite, as well as air conditioning, fan and safe deposit box. At 16 square meters, they are all big enough to add an extra bed.